Whether you are a HR Manager, a Small Business Owner or a Project Manager who is responsible for tracking leave/vacation/time-off taken by employees, you will find this simple and effective vacation tracker template useful. 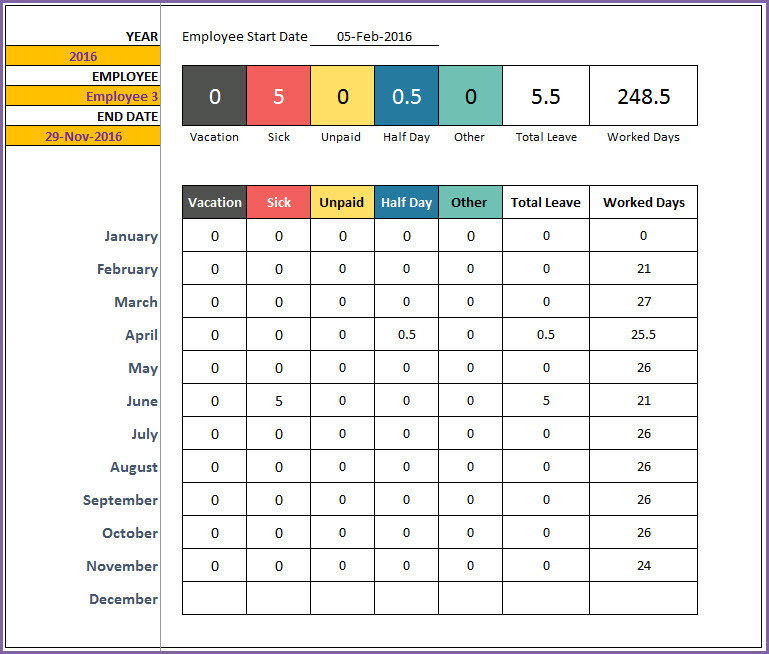 This leave tracker Excel template enables vacation tracking in an organized way, calculates employee attendance, presents a calendar view of leave across multiple employees and also prints an annual employee report. 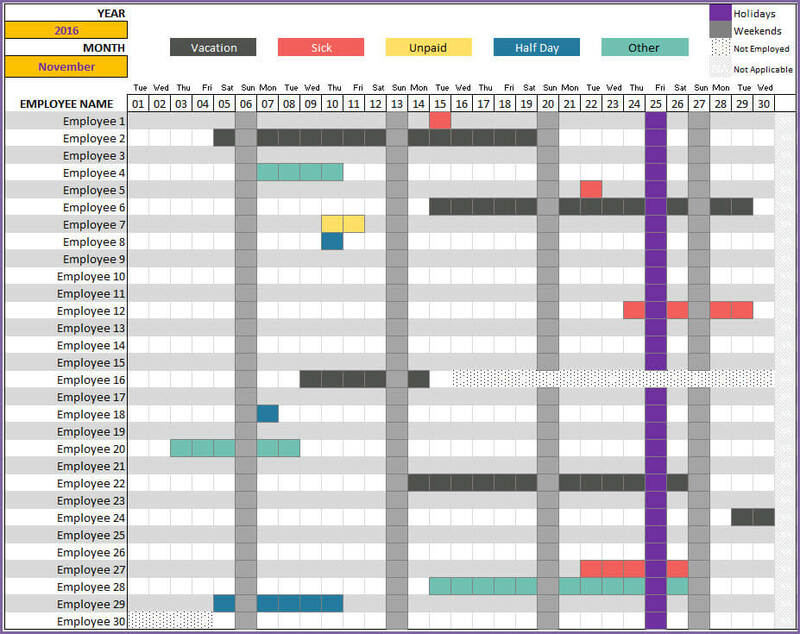 Here is a sample of Leave Tracker dashboard you can create instantly using this Excel Template. The following are the highlights of the template. A fully self-paced video course explaining each step in building this template is available. The template has 5 visible sheets. (Settings, Employees, Leave, Team Dashboard, Employee Report). Here is the overview of steps to use the template. Now, let’s see the steps in more detail. Before we begin, if you are new to Excel tables, please read Introduction to Excel Tables for data entry. Data entry in all our templates use Excel tables and a quick introduction to that will get you going in the correct direction. The template by default supports 5 types of categorizing your leave. Since different companies may have different names and different number of leave types, the template supports customizing them. By default, you will see the leave types (Vacation, Sick, Unpaid, Half Day, Other). You can just type over these names and replace with your own preferred names. You can see that there is an option to assign ‘Day Value’ to each leave type. This setting is present to handle partial days of leave. For example, I have entered 0.5 for ‘Half Day’ leave type. That means that when an employee takes Half Day leave, template will add 0.5 to leave taken total and reduces the Worked days by 0.5. If your company allows 2 hours leave in an 8 hour workday setup, that would be 0.25 day. You can create a leave type and enter 0.25 as ‘Day Value’. In order to calculate attendance of employees automatically, we need to know company weekends so that we can remove them from working days. 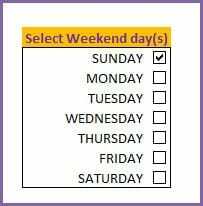 Since our goal is to provide a global solution to vacation tracking, we have the option of selecting any combination of weekend days. In the screenshot above, I have chosen Sunday as Weekend. So, this tells the template to do 3 things. While calculating attendance, it will not include the Sundays as Working days. Sundays will also not get counted as leave. When an employees takes Thursday to Monday as Vacation, it will count only as 4 days of leave (Thu, Fri, Sat, Mon). Enter list of holidays in your company. The template will treat the holidays similar to Weekends for calculation purposes, but holidays will be displayed in a different color on the calendar. This allows us to view holidays and weekends distintly. Now, we move to the Employees sheet. We will enter the Employee Name, Start Date (date when the employee began employment) and then Termination Date (if applicable). The Start Date and Termination Date allow the template to calculate the count of working days for each employee correctly. Since the template can help you manage leave for multiple employees for long term windows (even many years, as there is no limit 🙂 ), it is quite possible that new employees join the company and current employees may leave. I want the template to work smoothly for you even when that happens. Now, for the last data entry section, we move to the Leave sheet. We enter leave taken by each employee here. There are four fields (Employee Name, Leave Start Date, Leave End Date and Leave Type) in this table. If an employee takes a 5 day vacation, you can enter that in one row by providing Leave Start and Leave End dates. If an employee takes a single day leave, please enter same date in Start Date and End Date fields. Leave Type field has data validation built-in which shows the 5 options we set in the Settings sheet. Similarly the Employee Name also has data validation to allow only employee names available in the Employees sheet. But the drop down option will not activate until a new row is created in the table. If you like typing in the name directly, you can go ahead. If you prefer the drop down options, please read further below in the ‘Extensions’ section where I discuss a work-around . We are done with data entry. It’s time to see the template’ magic in creating the vacation calendar and report. The dashboard is interactive as it allows the user to choose the month for which we want to view the leave data for. We will enter the month by selecting Year and Month. There are two pages in this Dashboard sheet. First is the leave calendar view. As you can see from the above screenshot, the leave types are shown in different color. The legend is shown at the top indicating what each color means. In addition to the 5 leave types, we also have display for the following: Holidays (purple), Weekends (Dark Gray), Not Employed (Dot pattern) and Not Applicable (Diagonal Line pattern). Holidays and Weekends are self-explanatory. Not Employed will represent the days before the employee began employment and days after the employee termination date (if applicable). Not Applicable represents the days that are not actual dates. For example, if you choose November month, 31st day will be Not applicable. For February in a non-leap year, 29, 30, 31 will be Not Applicable days. You can use this calendar view to assess if you will have enough coverage in your team for specific weeks (for example, during the holiday season). This sheet also shows the monthly summarized count of days taken off under each leave type, total leave taken and Worked Days. Total Leave is the sum of leave taken under each of the 5 leave types. If an employee’s leave overlaps with a holiday or a weekend, it does not count as a leave day. Worked days represents the number of days an employee worked or is scheduled to work. You can look at this view during the last week of a month, to calculate the next month’s capacity (in work days) for the entire team. This will be helpful to evaluate whether you have enough capacity to meet the demand (work) ahead in the next month. While the previous sheet was about viewing all employees at once in a calendar view one month at a time, we also need to see one employee’s data across months. This is where the Employee Report comes in handy. Here we have three inputs. The Year and Employee Name selections should be easily understandable. End Date is set to Today’s date by default. This allows the report to show attendance/leave data as of today. You can change this End Date by manually typing in any date, if you want to create a report as of any specific date (a month end, for example). This sheet has 2 pages as well. First, the calendar view. As we discussed with the Team Dashboard, the colors and the legend work the same way. For the chosen employee and year, we can visualize the complete year’s leave patterns. The second page presents the summarized count of leave and worked days. No problem. You can just remove additional leave types easily. In this example, I have selected last 2 rows of the Leave Type table. Then, right click to bring up the menu that you see in the image below. Click on Delete –> Table Rows. How to enable drop down values for Employee Name in the Leave Table? First, we will extend the table to additional empty rows. Click on the end of the table and drag down. Once you do that, the table will look like below, with new empty rows. Now that you have new rows inside the table, the drop downs for both Employee Name and Leave Type will work. It is recommended that you add only a few empty rows at a time. The more rows we have, Excel has to process more data when it is performing calculations needed for our dashboard and employee report. This could slow Excel down. Can I remove employees from the file? On occasions, you may want to remove an employee’s name from the file if he/she has left the team. You can also remove the employee’s leave data from the Leave sheet, but that is optional. How can I share this file with my team? Press Ctrl+P or select Print from the File menu. Provide a name to the PDF file and click Publish. You can then email the PDF to your team members or post in your local shared drive. I don’t like the colors. How can I change them? Colors are personal preferences. Sometimes, you may want to use your company’s color palette in the documents. Not a problem. Let me explain how you can change the colors used in the template. As an example, I will show how to change the Holidays color. Open the Conditional Formatting menu from Home ribbon. Select ‘This Worksheet’ to show formatting rules used in the current sheet. At the top, you will see the rules used to highlight Not Employed, Not Applicable, Weekends and Holidays. Let’s select the Holiday rule (the purple one) and then click on ‘Edit Rule’. In the next window, click on Format to choose the new formatting. Now, you can see the option to choose a color. Select the color you prefer and click OK. You will need to click OK in the next couple of dialog boxes as well. Now, you should see the holidays represented in a different color. You can then save the file (Ctrl+S) to save your changes. In the conditional formatting rules, when you scroll down, you will see the colors used for the 5 leave types. Click on those rules and change colors if needed. The procedure is the same as we did for the Holidays. How can I edit the formulas? The sheets are protected. You can unprotect the sheets using indzara as password. If you are new to this, please read this article on unprotecting/unlocking sheets. What if I have more than 30 employees? Drag down for 6 rows as to fill them with the formulas. Now you should see 35 (29+6) employees accounted for. If you need to extend for more employees, follow the same steps but increase the number of rows you are copying. If you print or export to PDF, adjust print settings accordingly to include these new additional employees. How to add calculations such as Attendance %? You can unprotect the Team Dashboard sheet and add calculations if needed. For example, if you need to calculate employee’s attendance %, you can follow these steps. Then, select cell AP8 and drag down to fill the cells AP9 to AP37. This will add a column of Attendance % to the Dashboard. This was just an example. You can add any other calculations as needed for your company’s needs. I hope this template is useful. If you like it, please share it with your friends. If you have any suggestions or questions around tracking vacation in Excel, please leave them in the comments section. I will continue to enhance this template based on feedback. This is really excellent Tool provided by you. I need one support in this Tool that I have to maintain attendance of my 5 branches. If I get the column (BRANCH) after employee name than it will be more useful for me else I will have to maintain separate sheets for separate branch. By the BRANCH column I can use filter to take specific branch reporting. I will be highly thankful to you if you facilitate me by providing this change. Thanks. This is currently not available in the template. However, I am planning to include this feature in a future version (sorry, timeline not available yet for publishing it). there is so much work that has gone into this tracker, its a great piece of work. Is it possible to track absence by inputting the leave code directly into the day/month cell. eg, putting ‘S’ into the cell for today 8th April to log an employees sickness today. We have designed this template based on color codes rather than letter codes. We might have something similar in the future. I have a few employees who have different weekend days than the rest. Is there a way to update that without having a new form? This template is designed to have a fixed weekend. However, you can enter the leaves for each employee and assign a weekly off. However, it would be a lengthy process. Hi there! Tons of work was put into this!! Thank you! Month names are stored in the hidden sheet H.They have to be modified. We have used the complete date format to do the required calculations. They might get affected if the format is overlooked. You’ve put a lot of work into it. 1) How can I have assign specific Off-Days for each employee? I would like to adapt this for a 24 hour business, like hotel, factory, gas station, fast food, etc. 2) How can I Hide terminated employees from all dropdown list and team dashboard view? I would like to have a cleaner look especially when the dates being viewed are past the termination date. By specific off days, do you mean holidays/weekends are different for different employees? Hiding or filtering certain employees or employees from a certain department is a feature that will be added in future version. These two changes would require significant modifications that cannot be explained in 1 or two steps. Sorry. All I want to know is can I retrieve data from 16th to 15th of two months? This template is designed for a calendar month.